Banco CTT goes live with customer onboarding solution developed by Novabase. Canada’s ATB Financial and Germany’s ReiseBank use Ripple to complete world’s first banking transfer using blockchain. Asseco South Eastern Europe (SEE) named a Representative Vendor in Gartner’s report on open unified digital banking platforms. Fortune.com’s list of the five hottest companies in fintech features alums Kensho and Ripple. Kasasa’s MoneyIsland money-management game for children ranks among iTunes’ most popular apps. Chip-Chap bitcoin marketplace leverages SafetyPay as a payment method. The team from Novabase is up next. 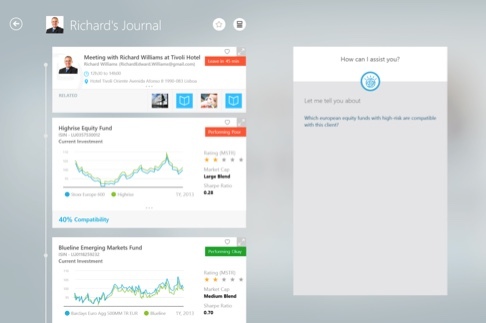 MyWizzio, powered by IBM Watson, is a smart machine for financial advisers that provides a unique approach to drive sales and productivity. Built as an intelligent ecosystem of apps designed to leverage your existing tools and third parties, the solution adapts around each user’s context, using cognitive computing to achieve a higher level of performance when managing research, relationships, and sales. MyWizzio extends this tailored experience to the end-clients, creating a more holistic landscape with the right mix of self-service and direct-to-adviser engagement. 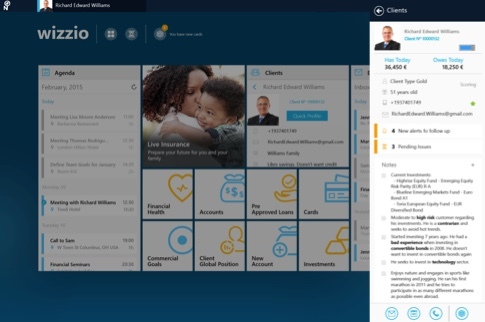 Novabase is presenting Wizzio and MyWizzio powered by IBM Watson which empowers financial advisers to drive sales and productivity, while creating a more fluid and lasting conversation with clients. It’s not about replacing the financial adviser, it’s about leveraging cognition and IBM Watson to radically empower her and her clients for more meaningful and efficient engagement. Wired column looks at LoopPay and the evolution of digital wallets. Silanis Technology partners with Box to help the cloud storage and file sharing specialist provide financial services. Bank of the West to offer photo billpay courtesy of technology from Fiserv and Top Image Systems. 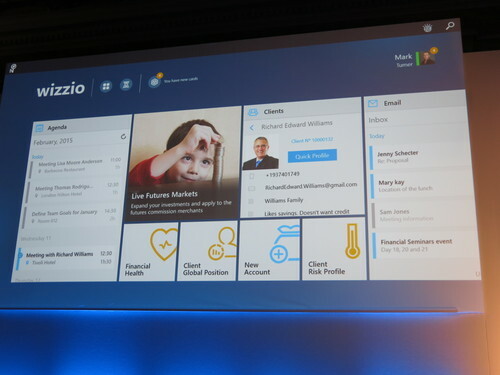 Finovate Debuts: Novabase Puts Watson-Powered Wizzio to Work Boosting Sales and Productivity. Mainstreet reviews top roboadvisors including Wealthfront, Betterment, Personal Capital, FutureAdvisor, SigFig, Motif Investing, and LearnVest. Prosper partners with Western Independent Bankers to offer consumer loans to unattractive borrowers. 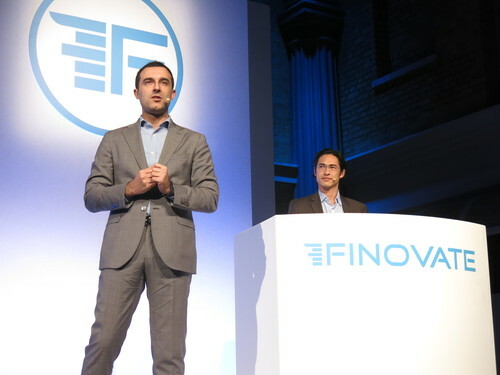 Tech City News features video highlights from FinovateEurope 2015. That Was Easy: Staples to Use Lendio to Power Small Business Lending. Daily Fintech looks at programmable bank trends via APIs from Fidor, Open Bank Project, Yodlee, and Xignite. AlleyWatch interviews MaxMyInterest CEO and founder Gary Zimmerman. Is it a contradiction that technology can make it easier for bank relationship managers and other financial professionals to do a better job of providing more “human” engagement? That’s the goal of Novabase, a new Finovate alum based in Portugal that is leveraging the cognitive computing of Watson to give financial professionals sophisticated resources to better serve their clients and customers. You may remember Watson as the supercomputer that surprised viewers of the game show Jeopardy! with its ability to outwit its human opponents. Now that same technology that was used to answer questions ranging from cable TV personalities to New Testament geography is being used in industries ranging from transportation and telecommunications to energy and financial services. Novabase believe that the greater connectivity and greater independence ushered in by the mobile world has made a major impact on consumers’ attitudes. Consumers now expect the institutions they rely on to be both more responsive and better able to meet us on our own, increasingly on-the-go terms. Consumers also increasingly expect personalization and customized service. Not only do consumers and clients expect you to be where they are. They also expect you to know, understand, and treat them as unique individuals, with unique, specific challenges. Technology like Novabase’s Wizzio Powered by Watson can help banks and other financial institutions respond to these demands with a proactive, multichannel approach. To the extent that getting to know customers is essentially data work, technology like Wizzio handles the heavy lifting, giving the sales professional the time and energy to focus on the “personal touch”. 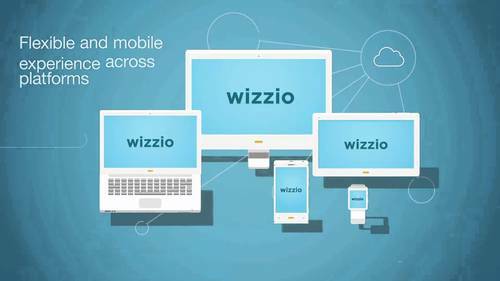 Wizzio powered by Watson can be thought of as an “intelligent ecosystem of apps and widgets” designed to help financial professionals keep track of everything they need to do their jobs more efficiently. Information on client accounts, finances, and investments are as readily available as agenda, email, and real-time stock market information. With Watson, the Wizzio is capable of responding to questions in natural language, and combines predictive analysis and cognitive computing to put critical and insightful information into the hands of financial professionals sooner. These time-savings equate into both more personal one-on-one time with customers as well as greater opportunity to add new clients. Platform features include the ability to interrupt processes and return to them later without losing place, and a “meeting mode” that allows professionals to share their device with clients and keep sensitive information hidden. Wizzio powered by Watson integrates with banks’ existing systems, and can be added to by third party and in-house development teams. The company sees its growth very much tied to the spread and proliferation of smart machines – from phones, to tablets, to wearables and beyond. And as computers and artificial intelligence change our ability to process and integrate data, we should anticipate more ways tools like cognitive computing can and will be applied to our daily lives. Novabase’s video demo from FinovateEurope 2015 will be available soon in the Finovate Video Archives section. Our final presenter of the day, Novabase, is here launching its solution for bank relationship managers and financial advisers. 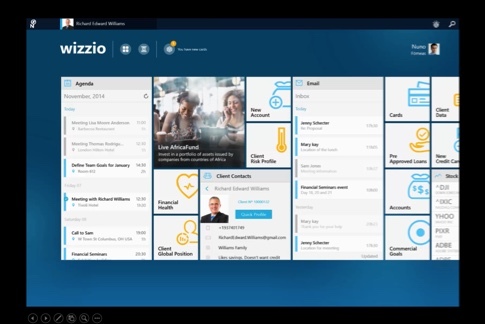 WIZZIO, powered by IBM Watson, is a next-generation sales tool for bank relationship managers and financial advisers that provides a unique approach to drive sales and productivity. Built as an intelligent ecosystem of apps and designed to leverage your existing tools and third-party integrations, the solution adapts around each user’s context, using cognitive computing capabilities to achieve a higher level of performance when managing research, relationships, and sales.